Last month, a contingent of joint IVRC & Silverdraft Supercomputing representatives traveled to Idaho Falls for a day filled with demonstrations, tours and discussions at the Idaho National Laboratory (INL) and the Center for Advanced Energy Studies (CAES). 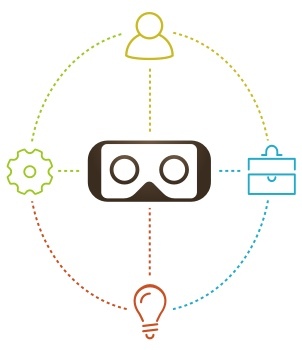 The team set out to learn how organizations are leveraging immersive technology as well as build the overall Idaho Virtual Reality collaboration network. For me personally, I was keen to see how the INL VR technologies and use had advanced over the last two decades and I was not disappointed. IVRC President Annie Morley with Dr. James Money in the CAVE. Led by host, Ethan Huffman, the agenda began with Dr. James Money, lead of the Advanced Visualization Laboratory (AVL). Dr. Money’s team is made up of two full time researchers, a post-doc and five college interns who spend much of their time helping scientists and engineers visualize their research data, examine it, and provide deep analysis. The AVL contains several 3D immersive environments, but the real star is the four panel rear projection laser-based Computer Assisted Virtual Environment (CAVE) that enables the immersive graphical display of advanced visualizations on three walls and the floor. Also in the AVL are other media including both a Vive & Samsung headset, advanced real-time tracking devices and several other monitors. Although the team supports mostly data computing they also create CAD & graphical visualizations and shared that they are using Unity more and more for rendering. After the AVL tour, we met with Eric Whiting, INL’s Director of Scientific Computing. In a room with a large rear projection 12’ by 6’ 4K stereo screen with tracking that is fully compatible with the CAVE system, Eric advised us that they have also deployed 10+ Inexpensive Interactive Immersive Interface (IQ) Stations (~$20k portable CAVEs) to various locations around the state. As per Whiting, “INL has been supporting the democratization of VR technologies and the building of a community of practice with VR expertise and VR problems to solve.” They see the use of VR not only in scientific visualization but also in scenario based training for situations that have “high complexity with high consequences”, enabling science that matters. Then came the tour of the supercomputing server room where all of this serious computing comes courtesy of the INL’s flagship high performance computing machine the Falcon supercomputer. The Falcon is an SGI ICE-X system, having a distributed memory system with 34,992 cores, 121 TB of memory and a LINPACK rating of 1,088 TFlops. Scientist use this computing power in conjunction with the Multiphysics Object Oriented Simulation Environment (MOOSE), program that provides the ability to perform a trillion math problems per second, supporting computations of 1/2 billion permeations & non-linear degrees of freedom. Worlds away from the Cray X-MP of 1995. A timeline on the wall showcased the INL supercomputers over the last several decades offering a fascinating glimpse at how quickly supercomputing technology advances and inspiring the team’s collaborative spirit as we brainstormed how even more can be achieved in the future. It was great to have Silverdraft Supercomputing there during this conversation. Two Idaho organizations working on the forefront of supercomputing. The Idaho Regional Optical Network (IRON) - Idaho’s high speed fiber optic backbone that “focuses on serving research and education in Idaho.” Researchers and educators use IRON to transfer ‘big data’ between the research universities, other educational entities, the national laboratory system, and the health sector. Very impressive Cybercore Integration Center development work that Wayne Austad, Technical Director is leading. Austad is part of a world-class team providing control systems and infrastructure cybersecurity innovation capability for the nation. Protecting our domestic infrastructure through cybersecurity. The Human Systems Simulation Laboratory where a nuclear reactor facility control room has been completely migrated from analog to digital! It was a privilege to go back to the INL to visit and collaborate with all of the teams. The INL employees remain a testament to the pioneering spirit of Idaho that drives us to providing cutting edge technology advancement and community.